WARNING: This entry is about as factual as most American media reports regarding Iran. Sirs: I'm writing concerning my observations of the so called Brighton scene. The Brighton scene is simply that; aside from the obvious film analogy; of which I shall return, there is a feeling one derives while cutting through the poky streets; where one can witness a near disharmonious biosphere of recent histories. This – I should add – is a biosphere only in respects of a time-space relationship. One can't help but notice the ignorant coexistence of [film] stills ranging back to the city's proud Victorian past; they are almost evenly distributed; these extras, decked-out by the charitable wardrobe departments. Lacking gainful employment (chosen or not); and at an increasing rate, they loiter; shamelessly available for such roles. I came to notice that they present an artistic importance also like that of an extra; essential in atmosphere only. I might like to suggest that in the absence of any filming there is a consciousness to be active; maybe a fear of foundation. So, in this spiritless age; an ageless age, they draw from the anarchic remnants to form an annual memorial known as the Fringe Festival. A recent tour of mine concerning a collection of essays entitled, "Rotting Briton", had me sat in turn; waiting before an audience during this self-concicious theatre. The event in itself may warrant a separate letter, in that this was the only leg of the tour that I was unable to speak. But, one is quiet careful to describe those series of events, and wishes not to indulge it further for fear of continuing this scene as others could have intended. Yet with brevity I shall elaborate. A veritable network of nepotistic neverbes - patiently waiting for their turn to be looked at - preceded my slot. A young lady of [London's] Royal College merit, filled time with mildly interesting perspective on neglected transient environments, to which proceeded with the conscious ignoring of the fart-cushion heckling (only arousing a glimpse over the spectacles at best). Getting only ten or so minutes into this, some previous speakers; Punch Judy and a policeman (not my embellishing metaphor) sought to evacuate her, later citing her and the event as, "artistically criminal". The spectacle gained the canned laughter it had no doubt intended (based upon the associates joint amusement) as she visible struggled with them; screeching, "no, this isn't it... guys - no, get them off. My hair?!" – surely the only time a Brighton extra played a part. With Punch and Judy either side the policeman began reading from a series of, "Artistic Bylaws", with proposals of, "zapping" – this, that and the other. Due to the alphabetic order of things and the limited time, my slot was, "zapped", maybe also intentionally. The event organizer then followed this scene; entering the stage with a self-congratulating smile; joking that he must be the crocodile – the silly sausage. Not wishing to continue my part, I chose a moment to exit this self indulgent trash; I'm tire of such self-congratulatory in-jokes. These specific Brightonian extras were the end of it, like Brighton's deepest available retrogrades, borrowing from the core of it and presenting it with a snobbish delicacy. They wear the weathered Victorian landscape with painful detail, presiding a silent authority on all things artistic. Propelled by a nostalgia for white supremacy, they expand in a passive aggressive manner as one's floral frock trumps another's panama hat. Romantic reassurance is found as one enjoys varying side-events like tea parties and picnics. Yet maybe this supremacy is haunting them through their high-ceilinged seaside-maisonette; that the consumed blood of our empirical fore-fathers is weeping with further need from the walls of their kitchens. I conclude that the, so called, Brighton scene is simply that; well bred children, caged in the trolley of our rotting commercial times; causing a public commotion – not by screaming for escape, but rather, presenting a shameless desire for the old and unimproved Battenberg. Borbonesa is a much-loved Brighton-based publisher of overly-wrought novelty printed matter. ZAPART is a brand new critical action group. 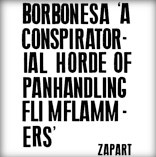 To celebrate the release of Borbonesa's new Micropaper - Emitron 4, ZAPART have prepared a response. Both the paper and response will be unveiled on Saturday 15 September 2007, 6-9pm. Entry is free.